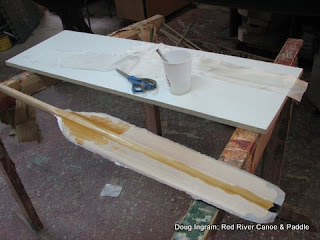 I'm exploring making one of my traditional paddles, in this case a Voyageur Classic, as an ultralight paddle. It is mostly cedar, so some reinforcing is required for it to holdup to the stress of harder use. A light weight 2 oz. 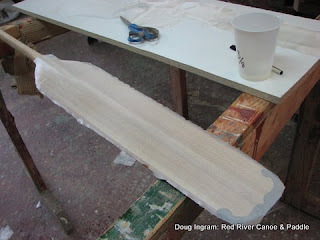 fiberglass is applied around the shaft and on the blade. Epoxy is applied and the glass goes transparent. This paddle is a project for myself, so its gets done in the inbetween times in the shop. I'll post more on it as it progresses. Posted by Doug Ingram at 9:48 a.m.